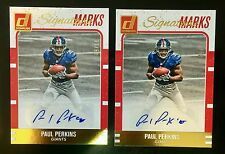 UP FOR SALE IS A... 2016 Donruss #10 Paul Perkins Autograph Gold "Signature Marks" RC 3/50 and 37/50 of the New York Giants (Lot of 2) Please see scan for exact condition. Card has been stored in a penny sleeve and toploader and kept away from the light. Only taken out of protection to be pictured so you can see any imperfections when buying. Card will be shipped in a toploader and team bag packaged securely inside of a bubble mailer shipped via USPS. 2017 Panini Select Select Swatches Patch Tie-Dye Prizm Refractor Parallel PAUL PERKINS #40 #11/25 New York Giants 2 Color. 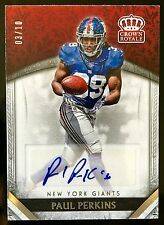 2016 Crown Royale #16 Paul Perkins Autograph Platinum RC 3/10 of the New York Giants. Only taken out of protection to be pictured so you can see any imperfections when buying. Very simple. If parts of the scans are not clear it is because of the protective casing around it. 2016 IMMACULATE COLLECTION FOOTBALL PAUL PERKINS #118 ROOKIE ON CARD AUTO 2 COLOR PATCH SP # 60/99. 2016 PANINI LIMITED FOOTBALL PAUL PERKINS #130 ROOKIE ON CARD AUTO 2 COLOR PATCH SP# 2/25. 2016 PANINI LIMITED FOOTBALL PAUL PERKINS #130 ROOKIE ON CARD AUTO PATCH SP# 198/299. UP FOR SALE IS A... 2017 Illusions #MD-PG Wayne Gallman/ Paul Perkins Dual Autograph Mirror Dual Signatures Blue RC 1/15 of the New York Giants Please see scan for exact condition. Card has been stored in a penny sleeve and toploader and kept away from the light. Only taken out of protection to be pictured so you can see any imperfections when buying. Card will be shipped in a toploader and team bag packaged securely inside of a bubble mailer shipped via USPS. 2016 Select Die-Cut Rookie Autograph of Paul Perkins. Short Print Numbered 17/99. Non-Machinable with thin card board support around the card. Card will still be in a top loader and bagged. 2017 Panini Spectra WAYNE GALLMAN - PAUL PERKINS Giants Dual Patch #4/10. Shipped with USPS First Class Package. UP FOR SALE IS A... 2016 Rookies & Stars #DFS-PP Paul Perkins Autograph Patch Dress For Success RC 6/10 of the New York Giants Please see scan for exact condition. Card has been stored in a penny sleeve and toploader and kept away from the light. Only taken out of protection to be pictured so you can see any imperfections when buying. Card will be shipped in a toploader and team bag packaged securely inside of a bubble mailer shipped via USPS. Winner will receive card in title. Actual card pictured. UP FOR SALE IS A... 2016 Preferred #176 Paul Perkins Autograph "Paninis Choice Red" Printing Plate Yellow RC 1/1 of the New York Giants This is a printing plate which was used in the making of the original card. Please check condition because these are worn to a certain printing plate degree. Please see scan for exact condition. Card has been stored in a penny sleeve and toploader and kept away from the light. Only taken out of protection to be pictured so you can see any imperfections when buying. Card will be shipped in a toploader and team bag packaged securely inside of a bubble mailer shipped via USPS. 2016 PANINI NATIONAL TREASURES. #/99 PAUL PERKINS RC PATCH AUTOGRAPH! ---# 40/99. This parallel card is number 11 from the Red Zone set from 2017 Panini SCORE Football. Year / Season - 2017. Find More 2017 Football Cards Here! Season: 2017. Player - Paul Perkins. Player: Paul Perkins. 2016 PANINI NFL CONTENDERS FOOTBALL. PAUL PERKINS. Serial Numbered 5/99. 2016 Prizm Draft Picks Purple Flash Refractor autographed rookie card of PAUL PERKINS. Winner will receive card in title. Actual card pictured. All cards are in good condition unless otherwise stated. 2016 PANINI NATIONAL TREASURES. PAUL PERKINS. RC ROOKIE PATCH ON CARD AUTO. CARD #RMS-PP -SERIAL #d 29/99! You are purchasing the exact card from the photos. 2016 Contenders CYAN Printing Plate Auto Paul Perkins 1/1 Giants! Variation SP. Condition is Like New. Shipped with USPS First Class Package. Breakout Star? This card is in near mint to mint condition and should grade well. Super thick Red version one of a kind #5/5 both patches 2 colors. All cards are in mint to nrmt-mint condition unless otherwise stated. 2016 PANINI PRIZM. BLUE WAVE PRIZM ROOKIE REFRACTOR /149. PAUL PERKINS. You will get the exact card shown in the photo! International buyers will follow eBay's global shipping program. Buyers must pay within 48 hours unless you contact me first! If you have any more questions, feel free to contact me! #22/49. Thanks for checking out my listing! I hope you have a wonderful day! 2016 PANINI LIMITED FOOTBALL. PAUL PERKINS. ON CARD ROOKIE PATCH AUTO /299. Serial Numbered 253/299. Paul Perkins. Card shown is the actual card you will receive. FREE Trial ! Auctiva's FREE Counter. Double your traffic. Set: 2017 Panini Origins Orange. Year: 2017. Player: Paul Perkins. Manufacturer: Panini Group. Team: New York Giants FB. YOU'LL RECEIVE THESE EXACT CARDS ABOVE! PAUL PERKINS 2016 Panini UNPARALLELED "ROOKIE DUAL MATERIAL " #'RD / 199 !! This is for a super nice 2016 Panini UNPARALLELED "Rookie Material Dual Jersey" # RM-PP PAUL PERKINS Rc. Card is serial #'rd 060/199 ! 2016 Panini Origins Football. Paul Perkins. Player Worn Material. UP FOR SALE IS A... 2016 Immaculate #129 Paul Perkins Autograph UCLA Team Logo Font Name Patch Gold RC 4/25 formerly of the UCLA Bruins and now of the New York Giants Please see scan for exact condition. Card has been stored in a penny sleeve and toploader and kept away from the light. Only taken out of protection to be pictured so you can see any imperfections when buying. Card will be shipped in a toploader and team bag packaged securely inside of a bubble mailer shipped via USPS. This is for a super nice 2016 Panini INFINITY ROOKIE MATERIAL JERSEY # RDM-31 PAUL PERKINS. Card is serial #'rd 16/88 ! VERY NICE JERSEY ! Card is serial #'rd 067/199 !